Tommy Watson: I know Danny had some familiarity with Japan and Japanese customs going into this trip with his Japanese heritage, and clearly Nori more so, but what was your knowledge of the culture and what were you expecting on this trip when you departed, Clayton? Clayton Arthurs: I knew the roads were really curvy, the cities were really high tech, and that the food would be different. One thing I did not expect was how beautiful the natural side of Japan was, mountains and rivers everywhere. Another thing I noticed is that the average age of people that were super into skating was higher. One of the best skaters I met on the trip was this dude named Yoshi who was 42 years old. He was doing standup toesides at like 70k, the guy absolutely killed it! Clayton Arthurs headed away from Fushimi Inari Shrine in Kyoto. TW: What was the biggest difference that you saw between Japanese and Canadian Customs? TW: How about the biggest similarity? CA: The biggest similarity I would say is one that parallels with the skate community and that is that everyone is super welcoming and hospitable. We were treated really well by everyone we met. Whether it was the Radicals Skate Crew inviting us to their barbecue after the Hyogo Longboard Friendship, or the Firefighter who let us stay at his house even though we just met him 3 hours before, everyone was extremely welcoming. TW: Who did you end up meeting over in Japan, and who did you do the most traveling with? CA: I actually didn’t know Nori (not sure if Danny did) leading up to the trip, us 3 did all of our travelling together in a tight space and I felt like we were all really close after the trip. I met up with an old friend on the trip named Junichi, he lived in North Vancouver (where I’m from) about 4 years before, and I used to skate with him quite a bit. It was really nice to see him again! 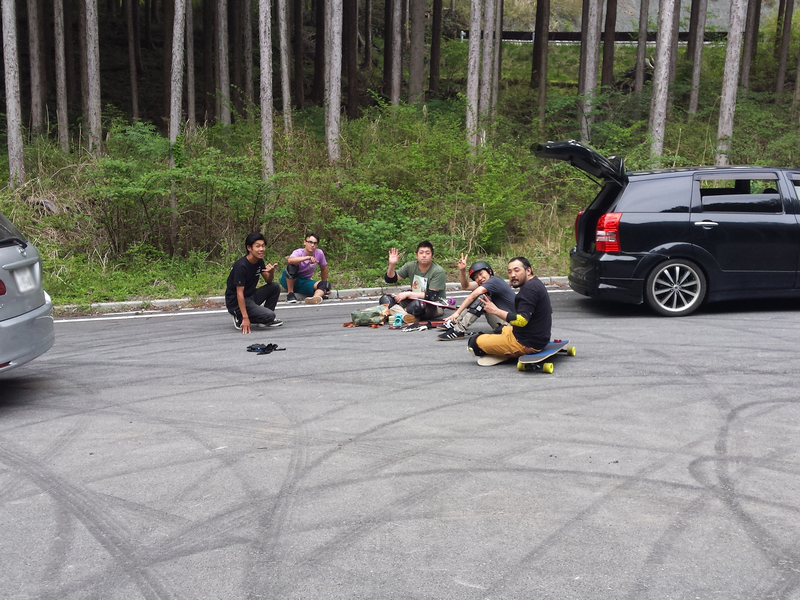 I met the Radicals Skate Crew at the Hyogo Longboard Friendship. They were a really cool group of people, all extremely stoked and really funny people; Shigenobu (Sig Mori) organized the event, Tomo (shinoda) was a really funny guy and sort of the leader of the crew, Mai (shinoda) was very nice and welcoming, and Kohei (Inoue) absolutely shredded. He is a really good skater, look out for him in the future! 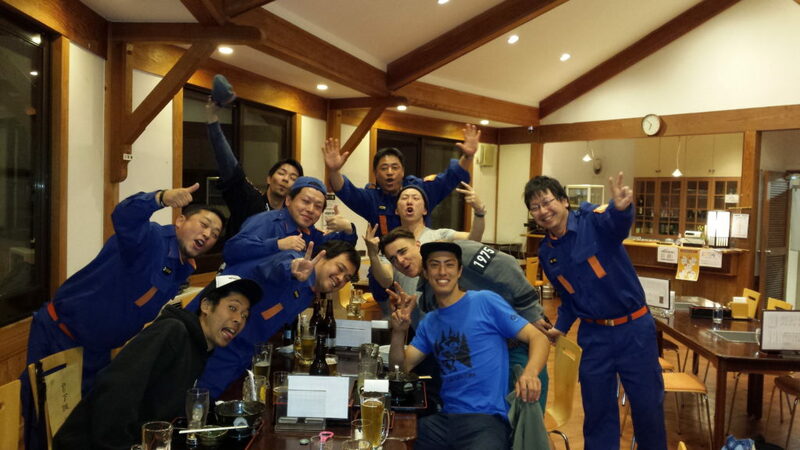 We also met a really cool bunch of Firefighters one night when we were Eating at a restaurant. They paid for our entire meal, bought us endless rounds of beer and gave us a place to crash after, which was awesome because we were turnt and desperately needed showers at that point. Hospitable firefighters got the boys endless beers and a place to stay. TW: Dude, that’s awesome. I found the same sort of vibe when I was living there. Certain niches of people are really happy to bring new people into the fold. That’s how the surfing community there was to me. Nori, you were more or less the guide for Danny and Clayton, right? Did you have any reservations or worries going into the trip? 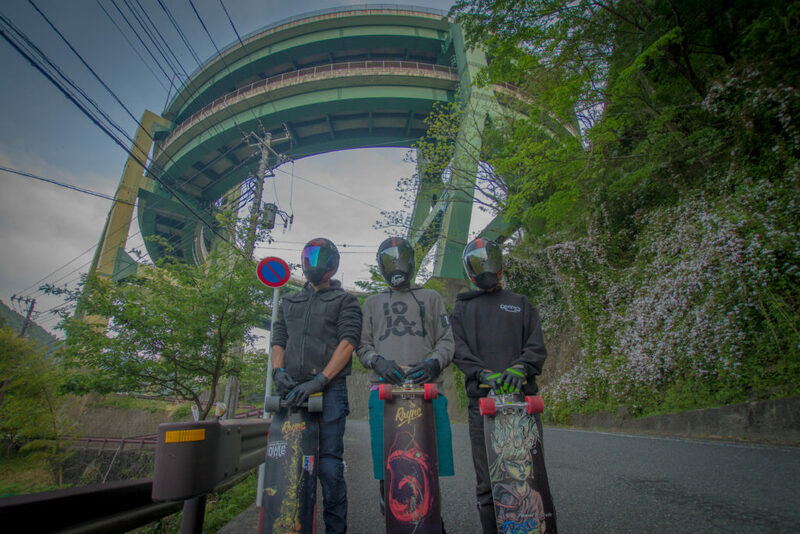 Noriyuki Tamura: Yah, I was the guide for the Skyline Tour, but was only a little worried going in because I have never done a skate trip like that in Japan. TW: Did these dudes make any major cultural faux pas while interacting with non-skater Japanese people? NT: Not really! They were very nice to non-skater Japanese people as well as others. For example, they learned some basic japanese: arigato (thank you), konnichiwa (hello) and more, so it came across that they were trying to have friendly communication with locals… I guess the one thing they did that is not cool in Japan is using duct tape on the bonnet of the rental car! TW: Haha :) Were there any roads that y’all hit that the Japanese scene didn’t know about before? Is initial D popular enough there that you’d already had this idea for road scouting? Everywhere you go, there will be places for you to jump off of with your skateboard. 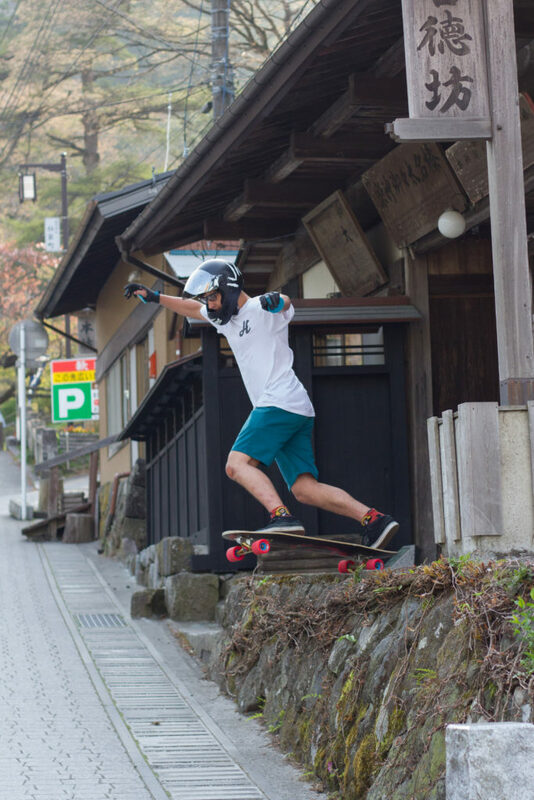 NT: I’d actually never been to the northern part of Japan for skating and didn’t even know there are bunch of gnarly roads there! So it was a good opportunity to visit and see what’s different. I wasn’t a big fan of Initial D, but I started to watch it thanks to George [Mackenzie] and Tony [Graves] when I stayed with them in BC. TW: Dude, that’s cool that even Japanese skaters hadn’t done the D route before. What is the standout memory for you from this trip? TW: Gotta watch out for those tickets if there are any repeats of this trip :) Danny, you put together the trip plan. What roads were on the must skate list for you and why? Danny Carlson: My top 3 I’d scoped out were Echo Line, Nanadaru Loop Bridge, & Irohazaka. Echo line is a ridiculous stack of over 50 hairpins, the loop bridge was something I’ve never seen before (the one at the end of the Best Of edit)… just such a good novelty factor, & Irohazaka is a one way downhill 30 hairpin stack or something crazy. Nanadaru Loop Bridge is just one of those things you have to see to believe. TW: Was this the first time you were in Japan? What about the country or culture stood out to you the most? DC: Yeah my first time! Definitely the thing that stood out the most was how conscious & respectful everyone is of each other. Japanese culture is almost as different as it gets from North American in a lot of ways. TW: What were the challenges you faced organizing this trip? 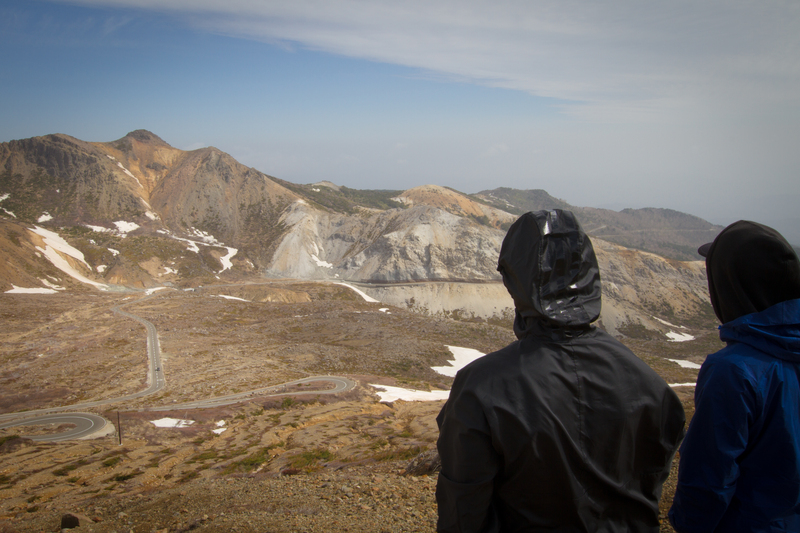 Volcanoes are common in Japan. This one is Bandai, and has a sweet road. DC: The logistics of filming the tight one lane roads with radios & a follow car was tough. Also staying on track to hit only the best spots & quickly move on from the sub-par ones. We had a lot of ground to cover in only 2 weeks so there wasn’t time to “chill out” anywhere, haha. TW: What about in practice? Did y’all run into any problems once you were there? DC: A lot of it was made up on the fly. Clayton & Nori didn’t have a ton of experience with cameras or follow cars, and our radios didn’t work in a lot of spots. We came up with systems to make it all happen & not get smoked by cars on the one laners… and not crash out rental car, that was always stressful, haha. CA: Yeah I would say the radios not working was a stress point at times. We also got rolled by the police at one spot just as we were about to drop in, and it was really unfortunate because it was easily one of the best roads we found. They were only there because they received a report that someone was impersonating a road block official, that person was Nori. TW: Man, it sounds like Japanese police are a lot more proactive about busting out-of-the-norm behaviour. Nori, if people are planning to travel to Japan to skate, what sort of reaction should they expect from locals and police? NT: Here, skateboarding culture isn’t that established, and people still believe skateboarding is kinda outlaw. Especially in the country side locals have a closed mind. It’s always better to be nice and friendly to locals! TW: Same over here man. Any time that I’m skating, whether it’s a new spot or a favourite, I really try and make sure to keep the people I come across happy so that I can skate that spot again. 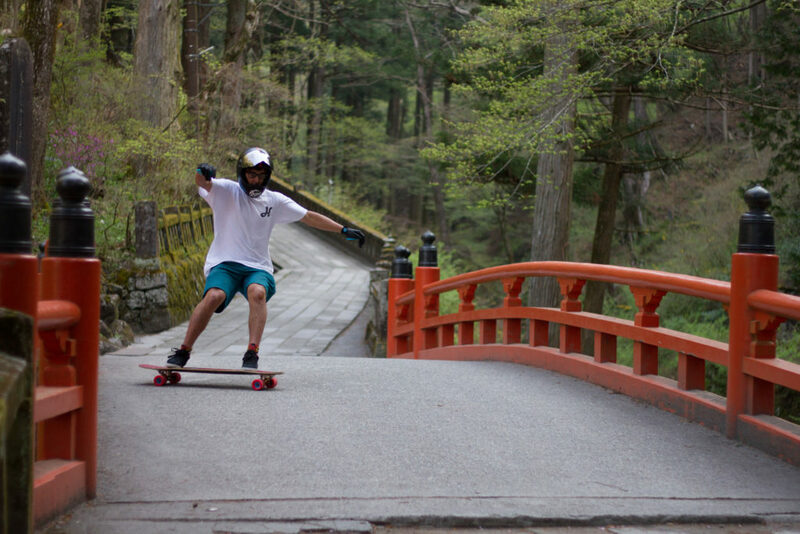 Is there a facebook group or good person for people to try to get in touch with who are looking to go to Japan for skate adventures? NT: Yeah, the Facebook pages to check out are Skate Slate Japan, Longboarding Session Japan, and Skatelife Shizuoka. As for a good person: Ayumi Oride, Fifer and Hajime Okada. They are in my skate family. TW: Dope, thanks man. Where is the epicenter of the DH community in Japan? NT: DH community? absolutely Shizuoka where I live now! Haha Or I say “Chiba” where is my crew and Yoshinori Takuma skating. TW: What is the main style of Japanese roads? Does this change prefecture to prefecture? DC: They’re built much higher quality than in North America, but not as steep for the most part. Blacktop pavement is the norm even for one lane mountain roads & combined with a generally lower grade, it’s difficult to find runs with lots of sliding. Most prefectures had a mix of full grip wide hairpin and small one lane mountain roads. When you prefer chunder-crete to perfect blacktop. CA: I noticed that all of the roads were quite narrow, curvy, some were really old, but most of them are maintained very well. I feel like they just pave every road there, I think we drove on like one gravel road the entire time. NT: Most of the roads are narrower than North American roads for sure, and with tight grippy corners. Yeah, it actuallydoes change prefecture to prefecture. For example in Hokkaido (northern most prefecture) has wide and smooth paved road that look like you’re in North America. I’m hoping to visit there this year. TW: If people don’t want to do a big road trip, and only have a week, where should they focus on if they just want to skate? What about just for culture/history? How about for a mix? DC: Gunma & Tochigi prefectures are loaded with my style of run, the steepest, fastest stuff we found. That’s pretty close to Tokyo so it’s easy to combine with some shenanigans in the metropolis & some temple visits, although Kyoto is much better for culture/ history. SDHC Crew with the Rayne Homies at 7 Stitches. CA: I really liked Shizouka Prefecture. That's where 7 Stitches is, AKA “the Matt K road” that was one of the most fun roads ive ever skated in my life. You can take it however you want and the pavement is amazing. I could have skated that road for days. It would be a good place for a freeride. TW: Hell yeah guys. Thanks for the run down on this trip! The Rayne Skyline tour concluded May 3rd, with Danny, Clayton and Nori having hit up 21 spots across 9 prefectures, all of which can be seen in the episodes found here.